When I used to hear the words ‘brook trout’, the image that came to mind was a pristine lake in Algonquin Park. Well, that image has changed. 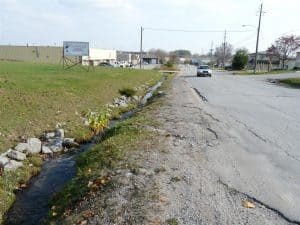 What I now see is a tiny stream running along Rye Street in this busy commercial and industrial sector of southwest Peterborough. As surprising as it may sound, this branch of Harper Creek is an urban coldwater stream and home to a native brook trout population – an ecological gem that no other urban area in the entire province can claim. And, if wasn’t for the work of a 15-year-old boy, we would know far less about these fish. Harper Creek originates in Stenson Park, which is located just north of Stenson Boulevard. One branch of the creek can be seen flowing adjacent to the CPR rail-line on the east side of Harper Road. Another flows through the ditch along the north side of Rye Street. Both are cold water streams which eventually discharge into Byersville Creek and on into the Otonabee River. The south tributaries flow through Harper Park, a 60 hectare (150 acre), municipally-owned, protected natural area. Roughly speaking, the Park is bordered by Westview Village condominiums and Holy Cross high school to the north, Harper Road to the east, Ramblewood Drive to the west and Fleming Drive to the south. Much of the park, as well as parts of the surrounding area, form a wetland which was recently designated as Provincially Significant. These wet meadows, forested swamp and marsh provide habitat to many locally-unique species of native plants and animals. The wetland is particularly significant because it contains numerous areas of groundwater seepage and coldwater springs which flow into Harper Creek. The bad news, however, is that Harper Park and the creek itself are under threat from multiple developments in the area, including the OLG casino and associated road development. The Harper Creek brook trout population is entirely wild; in other words, it is free from interbreeding with hatchery fish. This alone is a rarity. It is believed that the very substantial groundwater flow and coldwater springs have allowed the fish to persist in the creek despite channelization of some sections (e.g., along Rye Street), industrial development, storm sewer outflows and the dumping of fill into the stream bed. Up until recently, this population was never systematically studied. We don’t know, for example, how it has reacted to the many pressures listed above. Now, new developments along the stream such as the casino are likely to create additional stressors such as increased water turbidity (e.g., suspended solids like silt), increased artificial lighting and periods of more salt in the water from winter road maintenance. In the last three years, however, our knowledge of the Harper Park brook trout has increased a great deal, thanks largely to the work of 14-year-old Jacob Bowman. Jacob has had a personal interest in brook trout all his life. 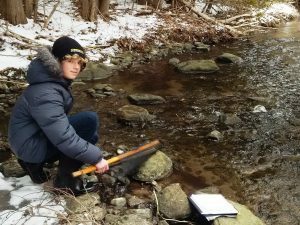 In 2014, when he was just 12, Jacob started studying the Harper Creek trout as a Peterborough Regional Science Fair project. In addition to making regular observations of the fish themselves, he sampled water temperature, water depth and the presence of invertebrates at various locations throughout the Harper Creek system. He found that the northern branch along Rye Street had the narrowest annual range of water temperature (9.5°C) and was both the coldest section in summer and the warmest in winter. Harper Creek, within the boundary of Harper Park, had the second narrowest temperature range (12.5°C), ranging from 3.5°C in winter to 16°C in summer. All other sections of the creek system had a far greater range. For example, during the extreme heat of July 2016, these sections reached temperatures of 20°C, which is close to the maximum temperature trout can cope with. At the same time, however, the northern branch was only 15°C. This was the coldest of all sites measured, and trout were observed here over the entire course of the study. Other sections of the creek system have less stable water temperatures and levels, which have led to highly variable occupancy by trout. As Jacob has demonstrated, brook trout are highly sensitive to water temperature, especially when it comes to spawning and egg incubation. The fish spawn any time from October to late November and usually choose shallow, gravel bottom sites, where spring water keeps the eggs well-oxygenated and relatively warm during winter. Prior to hatching, the eggs will need two to three months of development. They emerge from the eggs in February to March, but an egg sac is still attached. In this “alevin” stay, the fish remain in the protective gravel of the redd (nest), and all of their nutritional needs are provided by the egg sac. The sac slowly shrinks and the “fry” start swimming up from the bottom in March or April. Water from natural springs is warmed by geothermal heat from the earth. This will keep spring-fed creeks at water temperatures of between 5 and 10C, in contrast to surface water creeks which often see temperatures in winter drop to 0 C. Without this warming effect, successful egg development in brook trout is not possible. From a water temperature perspective, the northern branch is the highest quality trout habitat that Jacob assessed in the Harper Creek system. Trout in this branch are buffered from the heat of summer and the cold of winter. This allows them to save energy and enjoy enhanced survival compared to other sections of the creek. Jacob’s work has proven to be the catalyst for more research. The Peterborough Field Naturalists and the Ontario Federation of Anglers and Hunters are now partnering with Trent University to conduct a new, two-year comprehensive study of Harper Creek brook trout. The study will use a technique known as fish telemetry, in which acoustic tags are implanted in the fish. The tags are small, sound-emitting devices that allow the detection and/or remote tracking of fish in three dimensions. The study will begin this spring with the tagging of 20 brook trout Each trout will carry a radio tag weighing less than one gram, which minimizes impacts on the fish’s behaviour. Harper Creek brook trout are quite small, averaging only 7 inches – too small for anglers to keep. The research will be conducted by Scott Blair, a Trent graduate student. 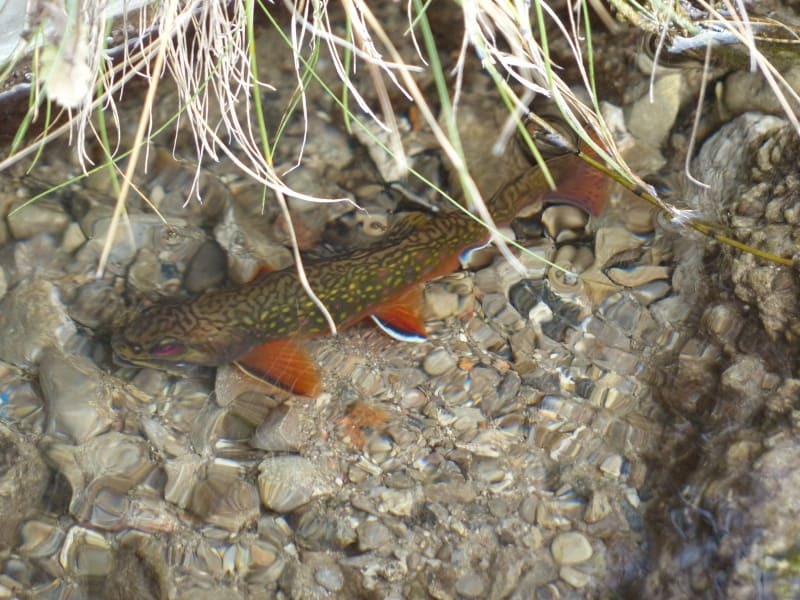 The study will track the brook trout’s seasonal movements and habitat use. Parameters such as water temperature, salinity, turbidity, prey availability and the abundance of other fish species will also be monitored. All of this information will be used to create a habitat model as well as identifying how human impacts are, and will be, affecting the fish. Like Jacob Bowman’s study, the researchers will be able to identify the most valuable brook trout habitat, project the potential impact of planned developments in the area and inform mitigation measures to protect this valuable population. You or your organization can collaborate in this research, too, thanks to a program called “Fund and Follow a Fish”. Two options are available. You can fund an individual fish by covering the cost of its $200, hand-made tag, or you can simply make a donation in any amount to the research effort in general. By covering the cost of a tag, you will be connected directly to an individual brook trout. You will receive a picture of your fish; information about its gender, length, weight and unique traits; data about where and when it moves within Harper Creek; and a copy of the entire study when published. A picture of you and your trout – you can give it a name! – will be posted on the Harper Park website. Most importantly, you will have the satisfaction of knowing that your funding will help researchers reveal the hidden life history of the beautiful ‘brookies’ in Harper Creek. At a time when approximately 80% of the brook trout populations in Southern Ontario have disappeared, you will be helping the Trent University team gather information that could help conserve brook trout in other communities. Go to peterboroughnature.org/harper-park/trout-study/ for detailed instructions on how to make your donation. The Harper Creek system is small, isolated and fragmented. It is often difficult for the various sub-populations of the fish to move from one section of the Creek to another. Harming any of the trout populations – and especially ones of high quality such as along Rye Street – will reduce the overall population size and increase the risk of all Harper Creek brook trout disappearing. Like many people in Peterborough, Jacob is concerned about the anticipated impacts from the proposed casino development and the Harper Road realignment. Any development in the area needs to maintain or enhance the connectedness of creeks in the system as well as the overall amount of cold water (including groundwater) habitat accessible to the trout. One option may be to leave the northern branch where it is, and to plant native trees and vegetation along the edge to further protect the creek from disturbance. Failing this, it may be possible to redirect the stream to within the protected natural area. Success, however, will depend primarily on intercepting groundwater sources. Failure to do so will lead to the loss of this trout population and possibly all of the Harper Creek brook trout. And, if you’re wondering about Jacob’s science fair project, he ended up winning in his category and bought himself some fishing equipment. You won’t find him fishing in Harper Creek, however!